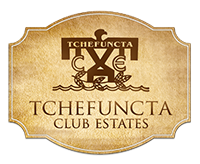 Tchefuncta Club Estates is located near Covington, Louisiana, a city of about 9,000 residents. Covington is the parish seat of St. Tammany Parish and has much to offer neighbors and prospective residents. The St. Tammany Parish school system is rated as a leader in the State of Louisiana and was named one of the top 100 school districts by Money magazine. St. Tammany Parish students score above national and state levels on standardized tests used to measure student achievement. The district includes seven “National Schools of Excellence” including Mandeville High School, the senior high school for Tchefuncta Club Estates. Madisonville Elementary and Madisonville Junior High provide for the educational needs of younger Estates students. The area also includes many fine private and parochial elementary and secondary schools. The Estates are located within the tax-payer supported Coquille Recreation District. The 45-acre sports complex has five baseball fields, three softball fields, two football/soccer fields, two gyms and two concession stands. Plans call for a new jogging and exercise trail, picnic area and children’s playground. Ponds on the property will soon be stocked with fish and a fishing pier will be constructed. The Covington area has a wide variety of shopping and entertainment options. From national chain stores to small eclectic boutiques there’s something to please every shopper. In downtown Covington restored historic buildings house restaurants, antique shops, art galleries, salons, spas and more. The tranquility and history of this small town are reflected in the cultural events and concerts that are a constant source of entertainment. The Three Rivers Art Festival, Sunset at the Landing Concert Series, the Columbia Street Block Party and weekly Farmer’s Markets are all fun free events that Covington families cherish.